Our story begins with a young man named George Thorn in the mid 1820's. Having grown up in a farming family, within the small town of Stockbridge in south-east England, George showed a propensity for astuteness & ambition from a young age. Like many other young men at the time, George enlisted at the age of 19 in the hopes of bettering his lot in life, a manoeuvre that would see him placed with the 4th King's Own (Royal Lancaster) Regiment...little could he have known the whirlwind of events that would take place over the next two decade of his life. Having successfully carried out deployments in Portugal & the British Isles, George's biggest adventure would begin in 1831, when orders were received to chaperone Convict Transports to the fledgling colony of Australia half a world away. On arrival in the colony, Thorn was pressed into service as an orderly for the newly-appointed Governor of New South Wales, Richard Bourke, a position that would allow him to witness a number of amazing events in the early history of Australia. 1837 became a major turning point in George Thorn's life, bringing about a twelve month period that would consolidate the rest of his days - early in the year, the 4th King's Own Regiment received orders to head to India. Given the choice of either following his Regiment back overseas or buying his discharge from the military & remaining in Australia, George chose the latter. Entering into service with the Commissary Department, George Thorn wasted no time in marrying & fathering the first of many children in Sydney, before heading north to the Moreton Bay Penal Settlement in the dying days of 1838. Within a short period of time, given his prior military experience, George was offered the position of Superintendant of Stock (horses, cattle & sheep) at the distant convict outpost of Limestone Station. The position would afford him a £60 per annum wage, as well as a thatched-roof residence coincidentally in the very near vicinity of the current-day Claremont. On Ipswich's closure as a convict outpost not long after, George took full advantage of his situation - he was one of only a few free men in the area, with considerable money in comparison to others in the Moreton Bay region, in a newly opened town without business competition - his ambition shining through, George immediately began to purchase parcels of land, & established a business in the Queen's Arms Hotel. By the late 1840's, George possessed considerable land holdings throughout the region, & sold his Hotel in order to move his business into the merchant market - a further manoeuvre that would increase his profits markedly over the coming decade. By this time, the township of Ipswich was a rapidly expanding centre west of Brisbane Town, & entrepreneurs were moving into the area in search of business & fortune. Enter John Panton - the son of the Post-Master General of New South Wales, John had earned a reputation in Sydney as a shrewd businessman & innovator, setting up a successful business partnership in Sydney, becoming an elected Member of the New South Wales Legislative Council, & earning the enviable position of Magistrate. However by the early 1850's, Panton began to look for new enterprises, a search which drew him north to the recently opened towns of Brisbane & Ipswich. On making a number of trips to the region, John realised the potential of the area & moved north to take advantage of the situation. With the support of Sydney-based company Messrs. Smith, Campbell & Co., John established the Ipswich company of Panton & Co. in 1851, trading from a store front in Brisbane Street...& business boomed. In the mid-1850's, as business expanded, Panton constructed a large warehouse on Limestone Hill, followed by a stately Georgian-style villa built of sandstone quarried at Woogaroo near current Wacol. Panton would name his new residence Claremont, & it's this same premises that has endured 154 years of history through until the present day. With the advent of the American Civil War in 1861, the market for cotton was at an all-time high - hoping to corner the market, Panton drew heavily on his assets & established a considerable cotton plantation at Woodend...however, his aspirations would lead to a temporary downfall. In 1863, the financial institutions with which Panton had dealings called in their debts, & Panton was left with no other option but to sell off the majority of his assets, including Claremont. Re-enter George Thorn - having been elected to the Legislative Assembly in 1860, on the back of Queensland's separation from New South Wales the prior year, George happily accepted his position of member for West Moreton. In 1862, he had also become an Ipswich Alderman, & by 1863 he was very keen to move from his lodgings at the Palais Royal Hotel in Brisbane Street to somewhere more befitting his roles & growing family. On Claremont being offered for sale in 1863, Thorn jumped at the opportunity & purchased the property - the stately villa would become the Thorn family home for over forty years. George Thorn's business endeavours continued to thrive, as did his political career over the next decade...in his free time, he undertook a number of civic duties around Ipswich & aided in the establishment of many of the town's facilities, such as the Anglican Church, the School of Arts, Ipswich Hospital, Ipswich Grammar School and the Queensland Pastoral and Agricultural Society, amongst others. During this time, George's son (George Henry Thorn jnr.) was also making a name for himself in Queensland political circles - whilst also residing at Claremont, George jnr. was elected as the member for West Moreton in the Legislative Assembly just as his father had been only seven years earlier. Representing West Moreton until 1874, George jnr. 's political career finally hit a high note in that same year, taking up the position of Postmaster-General under then Premier Arthur Macalister. However, the joy of this achievement would be somewhat short lived, with the death of his father some months after on the 28th April 1875 - George Thorn snr., considered the "Father of Ipswich," passed away in his bed at Claremont at 5:30am in the morning, at the ripe age of 70. Remaining on at Claremont with his mother Jane & younger siblings, George jnr. became the man of the house & continued his political aspirations. In 1876, on the resignation of Premier Macalister, George jnr. was unexpectedly launched into the role of Premier of Queensland - a responsibility he held for nine months until he too tendered his resignation. In the same year, Claremont was advertised for sale by public auction as a component of George Thorn snr. 's estate - George jnr. would purchase the property, continuing the Thorn's residency at the site. George jnr. would continue in politics off and on for the next 25 years, holding a variety of titles, including the enviable position of Commissioner to the 1878 Paris Exposition, where he held the responsibility of representing Queensland. In between his exploits, however, George would also lose his mother within walls of Claremont. On the 14th of April 1883, Jane Thorn passed away unexpectedly in the family home, much to the shock of the residents of Ipswich. Similarly to her husband, Jane had done much to support the charitable foundations throughout Ipswich during her lifetime, & it was reported that her funeral cortege was one of the largest seen in Ipswich for many years as her remains were transported to Ipswich General Cemetery to be laid beside her late husband. Fortunately, Jane's death would be the last at the site for many years, with the Thorn's residency continuing on for a further twenty years before the house was to finally change hands. By 1902, there seems to be some small amount of confusion regarding the Thorn's residency of Claremont. On the 18th of January 1902, The Brisbane Courier recorded details of a massive storm that had struck Ipswich four days previously. In the article, it was noted that, "a number of galvanised sheets of roofing were carried from the residence of Mr. G. Thorn M.L.A., in Thorn-street" - this property was clearly Claremont. 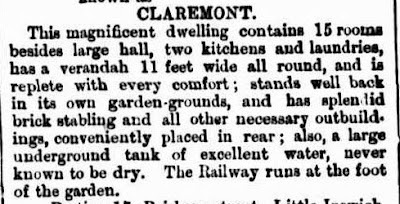 However, by June 1902, adverts were being run in the newspapers listing Claremont as a rental property, "recently occupied by the Hon. George Thorn." 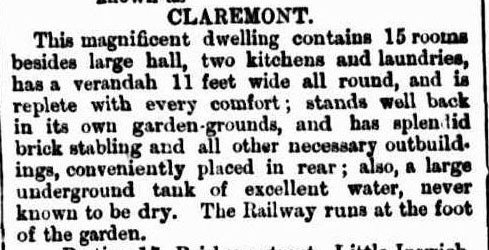 By late 1904, Claremont was advertised for sale by public auction, & the property was noted as being tenanted at the time by Mr McGill. Around this time, George & Celia Thorn were listed as residing at Corona, a house located on Booval Station (the current suburb of Booval) which was owned by their prominent bacteriologist son St. George Thorn. It was on this property, on the 13th of January 1905, that George Henry Thorn would pass away at the age of 66. For some years he had been suffering from gout, which in the period leading up to his death had seriously impeded his ability to walk - it's highly likely that the move to his son's nearby Booval property from Claremont was due to his need for extended care. 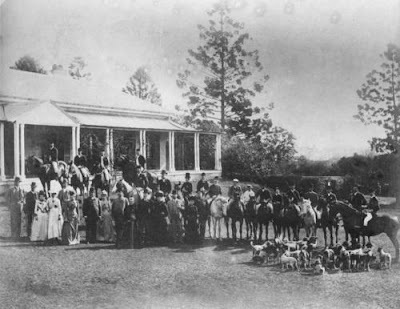 However, Claremont appears to have remained in the Thorn family until mid-1906, when it was again listed for sale by public auction - between George's death in 1905 & this renewed effort to sell the property in 1906, it appears as though Celia Thorn was still using the residence on an infrequent basis for entertaining. However, the property was successfully sold as a result of the 1906 public auction, & ownership of Claremont changed hands. The purchaser was George Rennie Wilson, who in turn allowed his brother John Cecil Norman Wilson & his young family to take possession of the building. Both George & John were descended from another pioneering family of Ipswich, both being sons of George Harrison Wilson - in 1853, George Harrison Wilson established a wholesale & general merchant business by the name of G. H. Wilson & Co., in direct competition with Benjamin Cribb's London Stores. Both sons dedicated their lives to the family business, with George Rennie taking control of the company on his father's death in 1899. For John & his family, life proceeded quietly at Claremont without record of incident, until 1922 when a bizarre turn of circumstance saw ownership of the premises change hands yet again. On the 12th of April 1922, John Cecil Norman Wilson passed away (possibly at Claremont). Ironically, his brother George Rennie Wilson, who owned the premises, had passed away two weeks previously on the 25th of March 1922. As such, at the time of John's death given his brother's prior demise, Claremont had already been locked up in George's estate. As George's wife, daughter & one son had predeceased him, his estate including Claremont was left to his one surviving son, Ralph Somerset Wilson. According to the CHIMS Heritage Database listing for Claremont, maintained by the Department of Environment & Resource Management, the premises was utilised as a boarding house between 1924 & 1939. However, we know a little more about this period in the site's history from external records. 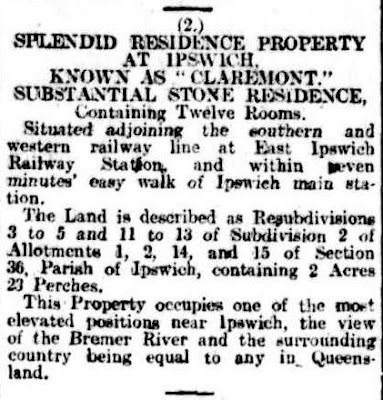 From Electoral Roll records, we know that Harriet Louisa Wilson, John Cecil Norman Wilson's widow, remained at the site until at least 1925, before moving to Brisbane - it's unclear as to whether Claremont had been converted to a boarding house prior to this time. We also know that Ralph Somerset Wilson & his wife Evelyn moved into Claremont from their previous residence at Booval in the later months of 1925, most likely at the same time of Harriet Wilson's departure. From 1925 onwards, Ralph & Evelyn remained at Claremont, likely as part-time caretakers whilst Ralph was still employed elsewhere. 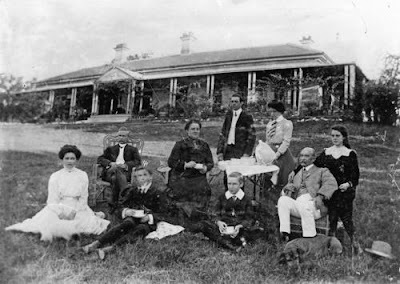 By 1939, Claremont was again put up for sale by Ralph Wilson, after which time both he & Evelyn moved to Brisbane...however, it's during the building's life as a boarding house that we come across a further event that may have given rise to one of the ghosts that are said to roam the premises. In December 1932, in the lead-up to Christmas, Kate Chellew Barkell was staying in the boarding house that Claremont had become. Her husband James was based in Ipswich, but was regularly away on business trips...Kate had spent countless years accompanying him on these journeys, but in her older age had begun to cut back on the regular travel. Having spent a number of years as an assistant at the Ellenborough Street Methodist Church, the Assistant Master in English at the Ipswich Technical College, a member of the North Ipswich Methodist Choir & a member of the Women's Church Help Society, Kate had moved into semi-retirement but still helped out where she could in the community. Unfortunately, on the 21st of December 1932, only four days before Christmas, she passed away in her bed within her room inside the Claremont Boarding House. Her death was acutely felt across Ipswich, & Kate became the last recorded person to perish within the building prior to the 1950's. In the early 1940's, Claremont was converted into flats, finally being sold to the Queensland Sub-Normal Childrens Welfare Association in 1964 for use as a school. By 1975, the property had become run down & in need of repair, & was sold to the National Trust of Queensland who embarked on a major restoration program to return the house to its former glory. In recent years, it's my understanding that the site has again been sold, & is now a private residence. Clearly, it's impossible to know exactly who haunts Claremont, however with the incredibly vibrant history to which the house has played witness over the past 154 years, it's not hard to believe that at least a few spirits likely drop in from time to time. That said, it's a nice thought to imagine that George & Jane Thorn, who both passed away inside the house in which they raised their family & took such a keen interest in Ipswich's development, still wander the halls of Claremont from time to time...&, if they still do, I'd love to know their impressions on current-day Ipswich in comparison to the outpost of Limestone Station they first laid eyes on all the way back in 1839! John Panton is my great great Uncle, his brother Frederick is my great great grandfather. thankyou for this read :) I can assure you like any strong minded Panton he will be haunting that house, i am sure it deeply upset him to sell Claremont. Great post.Thanks for one marvelous posting! I enjoyed reading it;The information was very useful. Please kindly visit our site to get more information about National Doctor Perth.